It’s no secret that there are many Canadian snowbirds that fly down for the winter months in Southern California; Palms Springs, in particular. With the average maximum “winter” temperatures in Palm Springs in November to March varying between 22-27 degrees Celsius and beautiful sun, who wouldn’t want to be there? But what can you do there? Well there is golf courses for sure, but what about some easy day trips? Do you enjoy wine? 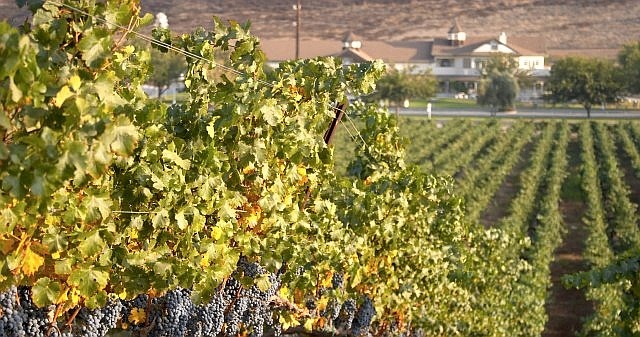 Hopefully if you read my blog, you are interested in wine, so I’m going to tell you about the Temecula Valley; it’s a short 1 hour and 15 drive southwest of Palm Springs, and it has about 40 wineries which you can visit. Recently took a day trip to the Temecula Valley to visit some of these wineries, while I was on my Spring Break vacation in Southern California. I was driving in from Capistrano Beach on the coast, and that still was just a 1 hour trip. A relaxing distance to drive either way to Temecula. The Temecula Valley Winegrowers Association (TVWA) has a very informative website with maps, showing different wine tasting tours you can do on your own. Most of the wineries I believe are family owned, so when you go to the tasting room, you are likely to be able to speak with an owner, which is always fun. Get them to tell you about their favourite wine, or how they decided to start a winery. Always good questions. Many of the wines you can only get from the winery, as they produce smaller lots of wine, so a drive out to visit, and pick up several bottles of wines you like and sip while you are on your patio in Palm Springs, or wherever you are vacationing, would be a good idea. Hart Winery was the first winery I drove up to. 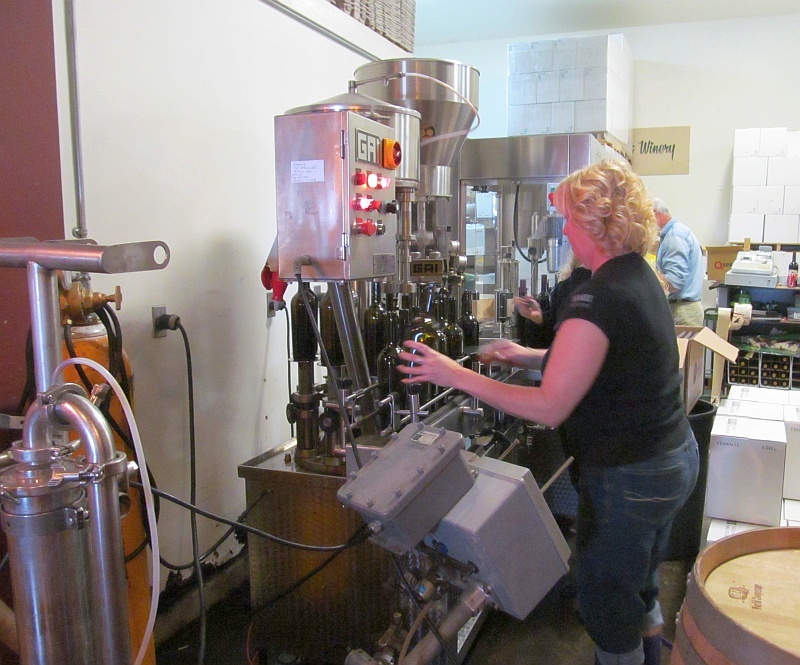 A small family owned winery, it was full of the sounds of bottles clattering as they were bottling some wines on that day. It was quite exciting to watch, beside tasting their wines. I was able to meet the owners, Joe and Nancy Hart, and one of their sons while I was there. Joe explained to me how they set down roots in the Temecula Valley planting grapes in 1974. One of the interesting things about the area is that it is not affected by the phylloxera louse which had devastated the vineyards of Europe, and required the European vines to be grafted on to American rootstalk in Europe. Some people say that wines produced on grafted vines like this never give you the true flavour of the grape, so if you want to taste wine made from ungrafted vines, then Hart Winery, and the Temecula Valley wineries, are one area offering you this opportunity. Two wines I enjoyed was their Syrah and Merlot. Hart Winery, Konchar Vineyard, Merlot, 2010 (USD $32). This wine has 6% Cabernet blended into it and the vineyard is just behind their winery. The wine is aged in Hungarian oak barrels. This wine was deep ruby in colour. It had red cherry aroma accompanied with some herbal, minty, and vanilla notes. Dry, medium body with medium acidity and round mouthfeel. Bright red cherry flavour with a dry puckering finish. Medium length. Hart Winery, Hart Family Vineyard, Syrah, 2010 (USD$30). 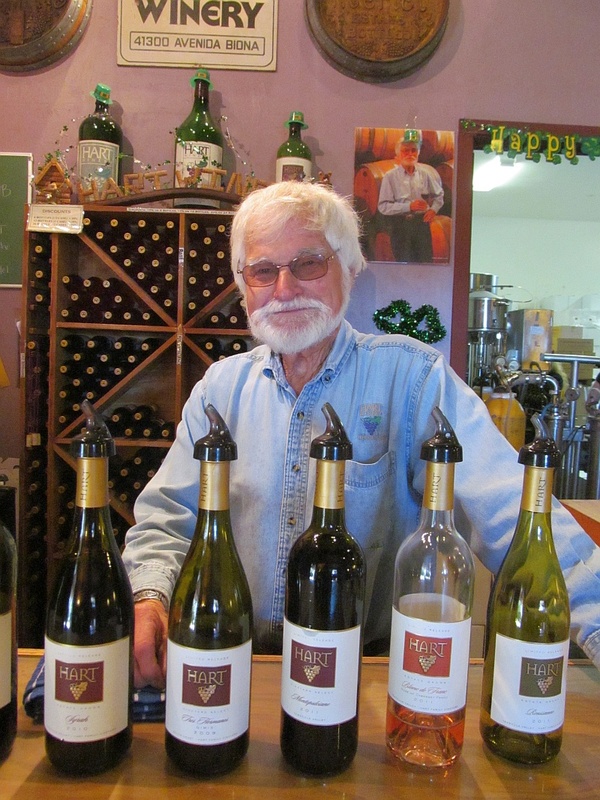 This wine is produced from vines planted in 1974 and 1975, the oldest vines from Hart Winery. Medium ruby in colour. Dark cherries, plum, some vanilla and sweet spice aromas. Dry, some roundness and some tartness on the palate. Dark cherries and blueberry flavours. Wiens Family Cellars Domestique 2010. This is a Southern Rhone blend of 44% Mourvedre, 29% Grenache, and 27% Syrah. It is rare that you see Mourvedre with such a high component in such a blend. Mourvedre is typically a blending grape, used in smaller amounts to provide colour, fruit and some tannic structure to compliment the fruity Grenache grape. This wine had aromas of red cherries, raspberries and vanilla in the glass. Full body, dry, with a soft mouthfeel. Cherry flavour with some smokiness and nice minerality (think Perrier water) to it. A really nice wine. 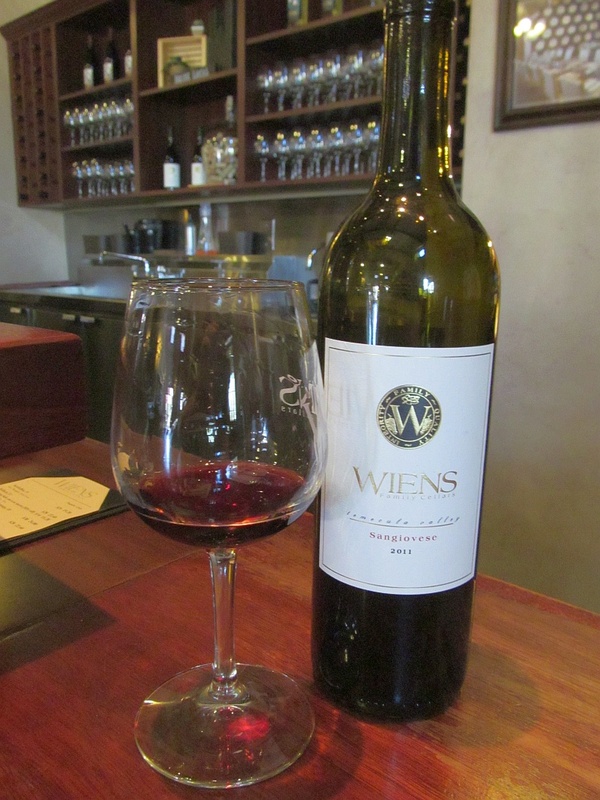 Wiens Family Cellars Cabernet Sauvignon 2010 (USD$45). Dark ruby/garnet in the glass. Dark fruit and vanilla with notes of mint and dill on the nose. Fully body, dry with a medium mouthfeel. Dark fruit flavour with that same minerality as I enjoyed on the Domestique. Medium length. I must note that I really like minerality in a wine, and many of the wines I tasted in the Temecula Valley had a mineral component to them. Something about the terroir there brings it out. Nice. Leoness Cellars Reserve Syrah, Vista del Monte Vineyard, 2008. This Syrah had a nice medium translucent garnet colour in the glass. Ripe raspberry and plums aromas, with a whiff of smoky sausages. Full body, round and dry, but very fruity flavoured. You may think that this wine is sweet, but it is not; the fruit is just very ripe. You get lots of ripe plums and black fruits. Good acidity, fine tannins, and also a nice mineral streak in this wine. Peppery finish. Quality. 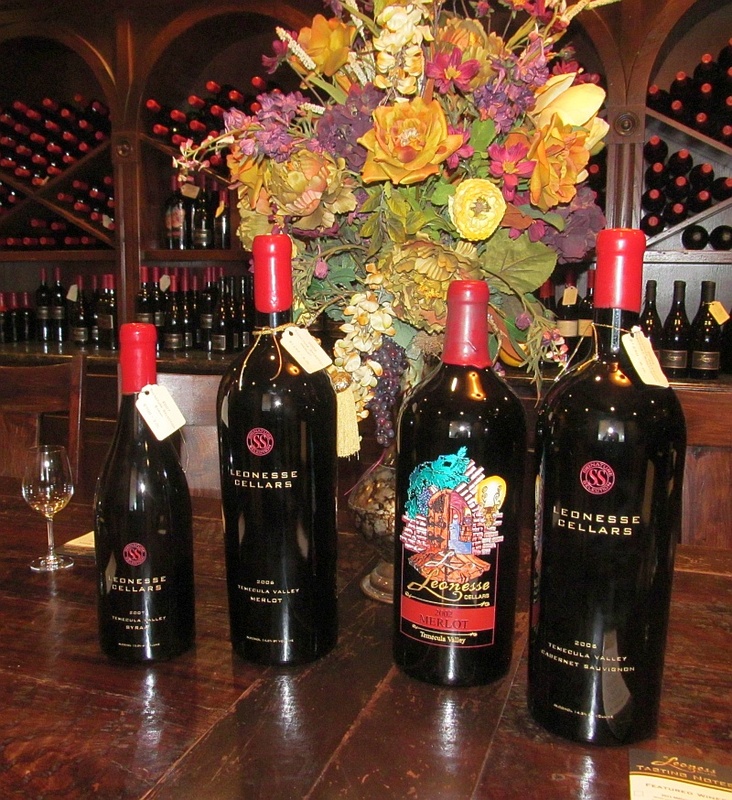 Leoness Cellars Signature Selection Syrah, 2009. The Signature Selection comes from the best barrels from the Reserve Syrah, which are given an extra 3 months of barrel aging before bottling. This wine was deep ruby in colour. Nice smoky nose with ripe raspberry fruits. Full body, lots of minerality, black currants dark fruit, and some smokiness on the palate. Round mouth feel with fine tannins. An exceptional wine! If you truly want to indulge in wine, try these two Syrahs. I really enjoyed my time at Leoness Cellars in the tasting room, but also sitting out on their deck overlooking the vineyards in the valley. Bring some cheese and charcuterie, get a glass of Leoness Syrah, and enjoy the deck if you have a chance. 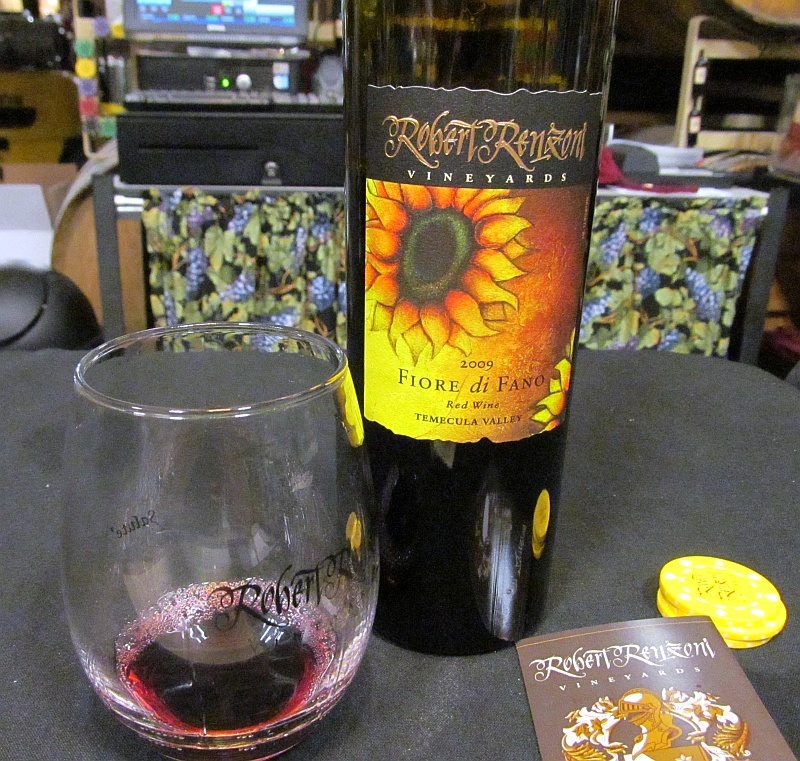 My last stop for the day was Robert Renzoni Vineyards & Winery. The history of wine making in the Renzoni family dates back to 1886 with Robert’s grandfather Federico working in the vineyards in Italy. Federico moved to the east coast of the USA in 1912. After experiencing Prohibition problems in 1918. Various wine import businesses were undertaken by the family. 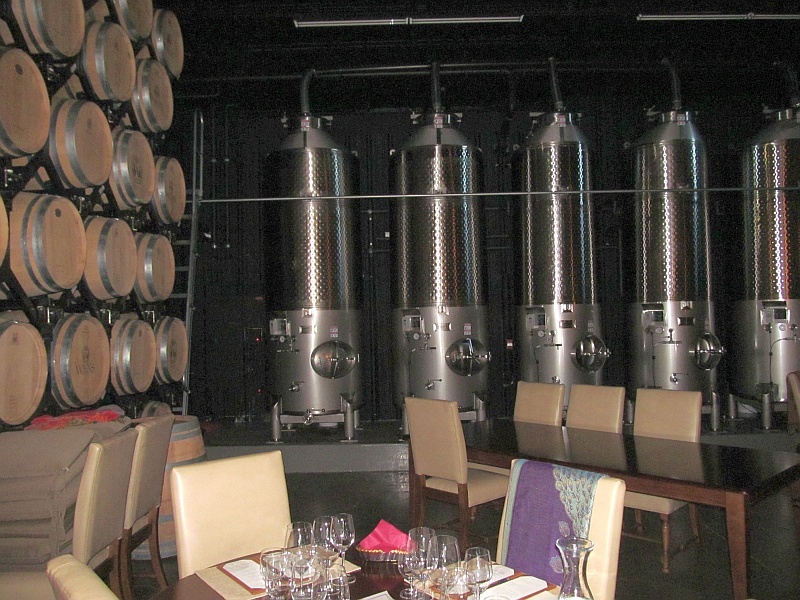 In 1996, Robert relocated to California and worked in the wine and liquor industry in Los Angeles for several years, then in 2004 purchased property in the Temecula Valley and began producing wine. With his Italian heritage, many of the wines produced use Italian grape varieties, and of my two favourite wines from Robert Renzoni one is a Sangiovese and the other a Super Tuscan. Robert Renzoni Vineyards & Winery Sangiovese 2009 (USD$28). I was told that this is the trademark wine for Robert. it is a very nice example of Sangiovese. Pale translucent garnet in colour. Nice aromas of cherries and vanilla. Medium body, dry with high acidity. Red sour cherries and some oak on the palate. Soft tannins. Very nice. Robert Renzoni Vineyards & Winery Fiore di Fano 2009 (USD$58). This is a Super Tuscan blend of 42.5% Cabernet Sauvignon, 42.5% Sangiovese, 7% Merlot, and 8% Cabernet Franc. Deep ruby colour. Cherries and oak aromas with a hint of smokiness. Full body, round and very mouth filling flavours and textures. Ripe cherries, dark fruit, some spice and a hint of tobacco, with a peppery finish. Bright flavours from this wine come from the balanced acidity in the wine. This wine has many layers of fruit and spice. Wonderful. 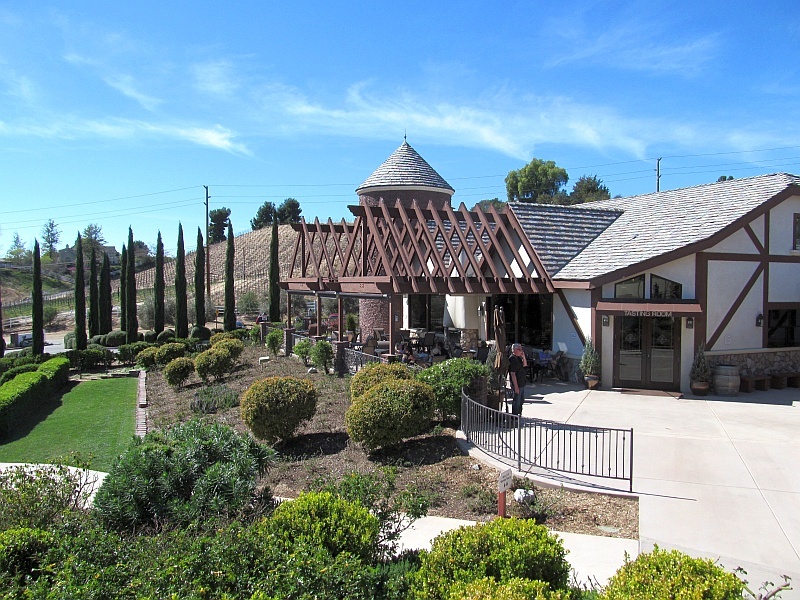 Driving back from the Temecula Valley, I thought about the excellent wineries I visited, and wines I tasted, and how many more wineries there are to try! Hopefully I will have a chance to go back to the Temecula Valley to find out. If you are visiting Southern California, it is an easy drive from Palm Springs, Orange County, San Diego, or Los Angeles to this relaxing wine region. Enjoy!